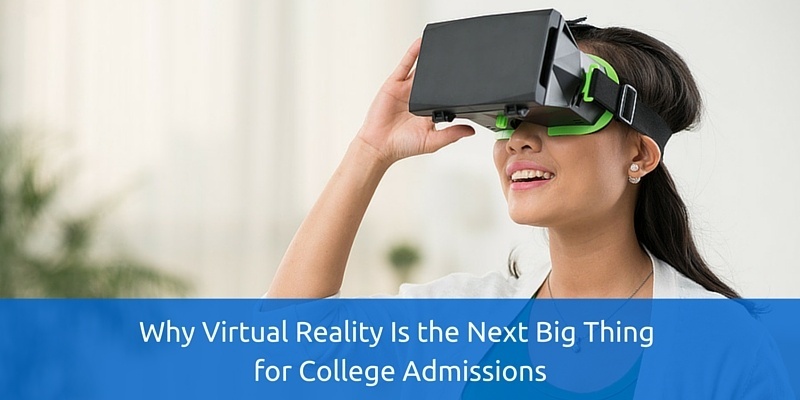 Several schools are already using VR as a tool in the admissions toolkit. In a Los Angeles Times article, we learn about a campaign by Savannah College of Art and Design in Georgia. The college sent Google Cardboard headsets to a few thousand prospective students. The goal was to give the students the ability to take a virtual tour of the school’s various campuses. A virtual reality tour is different than a 360-degree panoramic tour. A 360-degree video is limited to the filmmaker’s camera movements (here is a great example of a high-quality 360-degree campus virtual tour from Marist College). Virtual reality provides an immersive world where you can walk around in (assuming you are not tethered to a computer). The cost of the headsets is dropping to the point where it is in line with other direct mail print costs. While some high-end sets can run in the hundreds of dollars (HTC Vive and Oculus), the Google Cardboard device can be as low as $5 per unit. Besides the device, a school would need to produce the high-definition video. This is where a company like YouVisit comes into the picture. The content that a firm like this produces can be used for both VR devices as wells as 360-degree panoramic video presentations. The cost of producing this type of video is more expensive than traditional video, but the whole “immersive” experience for the viewer is worth the premium. Overseas students. For many students it is difficult, due to the time commitment and cost, to come and visit all the schools they are interested in attending. A VR package would allow these prospective students to get a sense of what the community and campus are like from the eyes of an existing student. Prospective students. A VR package as part of the recruiting process will help differentiate your school among the many direct mail pieces sent to the home. It creates the image of a cutting edge school. Using a cost effective device like Google Cardboard, you can keep the costs in line with other, more traditional direct mail outreach programs. Accepted students. With a VR package, you can give accepted students (that have not already taken a campus tour) a more in-depth sense of campus life and community. The idea is to entice them to take the time for an in-person campus tour. Virtual reality is more than a fad. Some schools are already experimenting with using it in their admissions process. It is a new technology that all schools should have on their radar screen.